Barbara Bouchet is an executive coach and psychotherapist with 25 years of experience helping leaders unlock their potential to better serve changing organizations and fulfill their potential. She is also a highly motivating writer and consultant to companies such as Microsoft, Costco and Philips Healthcare. Having worked with leaders in a number of diverse fields including information technology, industry, business, education, and the ministry, Bouchet hereby applies her considerable experience and voice in guiding readers toward the achievement of their highest calling. 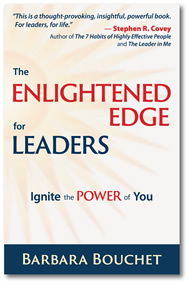 Bouchet’s book has one goal: “To show you how to become a more powerful and mindful leader who is deeply anchored in your inner truth and core of your being.” It aims to help the reader create a shift in identity that will expand how you see yourself and the world through examining the conflict between the Essential You (the leader you are capable of becoming) and the Limited You (the voice of inner doubt that holds you back). This involves a process of self examination and goal setting that Bouchet helps navigate by drawing from her own background in psychotherapy, executive coaching and spiritual inquiry. The essence of leadership is that it’s often lonely at the top, especially for those on the early edge of changing systems that may no longer work. This is especially true in the midst of the global economic realignment we find ourselves in right now. As old systems dissolve and we are forced to create new ways of adapting, finding one’s voice and path is a journey on which many of us will benefit from support. Change is a precarious process made less lonely and often more effective when shared with a mentor knowledgeable about patterns and pitfalls that can present. Bouchet’s book is noteworthy for the generosity of spirit she brings to bear upon the journey. While the book is addressed to leaders who may prefer to delve in on their own, the balance of introspection and objectivity this requires may be more efficiently accomplished in consultation with a trusted advisor. The book may be of greatest use when jointly employed by goal-oriented clients and coaches or therapists working together to navigate change. The book would make an ideal working companion for group and one-on-one coaching. It’s an apt time to act on the ideas in Bouchet’s insightful book and to work independently and together to make that a difference that matters.